Introduction: Fluoride prophylactic agents, such as acidulated phosphate fluorides (APFs), are being used extensively to prevent demineralization of white spot lesion around orthodontic brackets. However, corrosion has been reported in the acid fluoride solution prophylactic agents altering the mechanical properties of wires. Aim: The aim of the study was to evaluate the degradation in performance of four major orthodontic wires after short-term immersion in APF oral prophylactic agent. Materials and Methods: Four types of orthodontic wires were selected, namely, nickel-titanium wire, beta-titanium wire, stainless steel wire, and cobalt-chromium-nickel wire. These were immersed in a solution of APF-gel or APF-containing mouthwash. 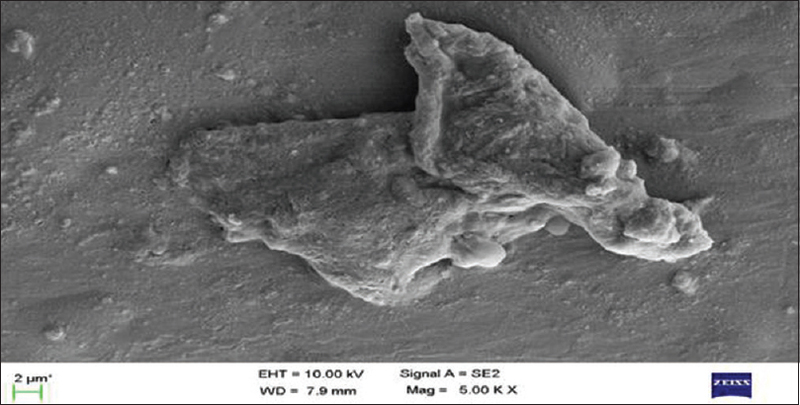 Surface changes of treated wires were observed under scanning electron microscope (SEM). The tensile strength of the wires was measured using universal testing machine. The data obtained were noted and subjected for statistical analysis using factorial ANOVA test. Results: SEM showed greater surface corrosion in nickel-titanium and beta-titanium wires and less surface corrosion in stainless steel and cobalt-chromium-nickel wires. Cobalt-chromium-nickel wires showed a higher mean tensile strength followed by stainless steel, beta-titanium, and nickel-titanium wires, respectively, when used with control and mouthwash immersion. With APF-gel, higher mean tensile strength was recorded in stainless steel wires. Conclusions: There was degradation in the performance of orthodontic wires after short-term immersion in the APF prophylactic agent. Greater surface corrosion was observed in nickel-titanium and beta-titanium wires, and less surface corrosion was observed in stainless steel and cobalt-chromium-nickel wires. One of the components of successful orthodontic treatment is the maintenance of good oral hygiene and caries control. To prevent dental caries, it is important to recommend regular use of products containing fluoride, in particular gels and mouthwashes. Fluoride prophylactic agents, such as acidulated phosphate fluorides (APFs), are being used extensively to prevent demineralization of white spot lesion around the orthodontic brackets. Fluoride promotes the formation of calcium fluoride globules that adhere to the teeth and stimulate remineralization while protecting against acid attack. However, the detrimental effect of fluoride ions on the corrosion resistance of titanium or titanium alloys has been extensively reported in the past decades., The fluoride ions are very aggressive on the protective titanium oxide film formed on titanium and titanium alloys. On the other hand, because the outermost surface of a nickel-titanium archwire contains mainly titanium oxide film with trace amounts of nickel oxide, fluoride-enhanced corrosion of the nickel-titanium archwire may also occur. In addition to corrosive surface changes, it has also been reported that experimental fluoride solutions degrade the tensile strength and microhardness of beta-titanium and stainless steel archwires.,, Therefore, it is plausible that commercially available topical fluoride agents may cause a corrosive and alter the mechanical property of beta-titanium and stainless steel wires. Hence, the aim of the present study was to evaluate the degradation in performance of four major orthodontic wires (nickel-titanium, beta-titanium, stainless steel, and cobalt-chromium-nickel) after short-term immersion in APF oral prophylactic agents. The present in vitro study was carried out in the Department of Orthodontics and Dentofacial Orthopedics, The Oxford Dental College, Bengaluru. Four major orthodontic wires, namely, nickel-titanium wire (Ortho Organizers, CA, USA), beta-titanium wire (Ormco, Glendora, CA, USA), stainless steel wire (Ortho Organizers, CA, USA), and cobalt-chromium-nickel wire (G and H Company, Indiana) were selected for the study. Inclusion criteria: New, unused, straight length, round cross-section, and 0.016-inch diameter wires as obtained from the manufacturer will be used for the study. Exclusion criteria: Recycled wires and wires obtained from patient's mouth. The selected wires of type were grouped into four groups, i.e., Group 1: Nickel-titanium wire, Group 2: Beta-titanium wire, Group 3: Cobalt-chromium-nickel, and Group 4: Stainless steel wire consisting of 15 wires in each group. Each group was further subdivided into three subgroups, consisting of five orthodontic wires each, as follows: Subgroup A consisting of five orthodontic wires which was used as control group, Subgroup B consisting of five orthodontic wires which was immersed in 10 ml of APF-containing mouthwash (Phos-flur®, Colgate Oral Pharmaceuticals, India), and Subgroup C consisting of five orthodontic wires which were immersed in solution made with APF-gel (Fluorovil®, Vishal Dentocare Pvt. Ltd., Gujarat, India) [Table 1]. Two-centimeter length of APF-gel was taken on a paper and weighed. The weight was 1.20 gm. It was then transferred to a test tube. Twenty milliliters of normal tap water was added to the test-tube and shaken well till the uniform test solution was obtained. The gel was completely dissolved in the tap water to make a test solution. One hundred millimeters of each wire was measured with digital Vernier caliper and was cut using light wire cutter. These prepared wires were immersed separately in test tubes containing a solution of APF-gel and APF-containing mouthwash. The test-tubes were placed in an incubator at 37°C for 60 min. The wires were then taken out and dried. Surface changes of treated wires were observed under scanning electron microscope (SEM) (JEOL, JSM-5600 LV, Tokyo, Japan). The tensile strength of the wires was measured using Universal Testing Machine (Lloyd LR 50K). The measured tensile strength values of all the wires were recorded. The data obtained were noted and subjected for statistical analysis using factorial ANOVA test. Descriptive statistics (mean and standard deviation) were calculated for all the measured variables. Multiple comparisons were done using a Bonferroni method. All the four tested orthodontic wires in the control group had some amount of surface defects on the entire surface. Nickel-titanium wire immersed in a solution of APF-gel and APF-containing mouthwash showed the increased morphological deformation due to corrosion [Figure 1] and [Figure 2]. Beta-titanium wire immersed in a solution of APF-gel showed the uniform formation of corrosion products along with morphological deformation on the surface of the wire [Figure 3] and [Figure 4]. Cobalt-chromium-nickel wires showed scratches and localized pitting type corrosion in wires immersed APF-containing mouthwash [Figure 5] and [Figure 6]. Stainless steel wires exhibited similar surface roughness, and the corrosion products were distributed homogeneously [Figure 7] and [Figure 8]. In the control and APF mouthwash group, cobalt-chromium-nickel wires showed highest mean tensile strength while nickel-titanium wires showed lowest mean tensile strength. In the solution of APF-gel group, stainless steel wires showed highest mean tensile strength whereas nickel-titanium wires showed lowest mean tensile strength [Table 2]. When the mean tensile strength was recorded in a combination of wires and immersions, it was seen that highest mean tensile strength was recorded for cobalt-chromium-nickel wires in APF mouthwash group while highest mean tensile strength was recorded for stainless steel wires in a solution of APF-gel group [Table 2]. For the mean tensile strength recorded in all the immersions, lowest mean tensile strength was observed in the APF gel solution for all the wires compared to control and APF mouthwash [Table 3]. 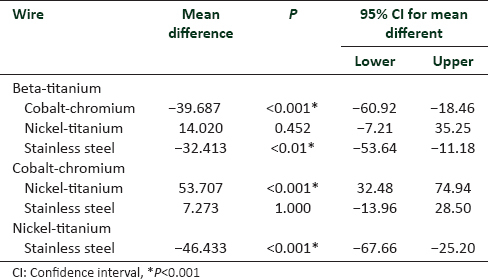 It was noticed that the difference in mean tensile strength among the different wires was found to be statistically significant (P < 0.001) with cobalt-chromium-nickel wires recording a higher mean tensile strength followed by stainless steel wires, beta-titanium wires, and nickel-titanium wires, respectively [Table 4]. Compromised oral hygiene is frequently associated with fixed orthodontic treatment which can result in enamel demineralization. To address this potential treatment complication, orthodontist commonly suggests to daily use of topical fluoride. Fluoride arrests demineralization and promotes remineralization. Orthodontic alloy wires, namely, nickel-titanium, beta-titanium, stainless steel, and cobalt-chromium-nickel wires, exhibit good corrosion resistance owing to thin protective films on their surface. However, corrosion has been reported in acid fluoride solution prophylactic agents. Degradation can lead to decrease in the mechanical properties of wires. Hence, the aim of the study was to evaluate the degradation in performance of four major orthodontic wires after short-term immersion in APF oral prophylactic agent. In a study, fluoride-containing toothpaste or dental prophylactic gels (5 g) were ultrasonically mixed in a polypropylene tube, followed by centrifugal treatment. The upper clear liquid without the deposits in the tube was used as the immersion test environment. However, this is not feasible in the oral cavity. Hence, in our study, a solution of APF-gel was prepared by mixing 2 cm of APF-gel (1.20 gm) in 20 ml of normal tap water. The wires were immersed in test solutions for 60 min. This exposure time is equivalent to fluoride application in the regimen of twice daily for 2 min for 15 days. Walker et al. immersed the wires in fluoride agents for 1.5 h which is equivalent to 3 months of 1-min daily applications. On observation of the wires under SEM, all the four tested orthodontic wires in the control group showed some amount of surface defects which were observed on the entire surface. This may be related to wiredrawing, pickling, or electropolishing procedures performed during the manufacturing process. Nickel-titanium wires displayed increased morphological deformation after immersion in both solutions of APF-gel and APF-containing mouthwash. This may be due to that the higher content of hydrogen in nickel-titanium alloys absorbed during electropolishing. Hence, diminution of the hydrogen content by the manufacturer will help improve the clinical performance. The beta-titanium wires immersed in APF-containing mouthwash showed crevices, pits, and minor morphological deformities, while in a solution of APF-gel, it showed uniform surface corrosion along with morphological deformation. On comparison of both the titanium alloy wires, highest surface corrosion was observed in nickel-titanium wires than beta-titanium wires. This is because, in acid fluoride solutions, the breakdown of a titanium protective film occurs readily, and nickel-titanium alloy absorbs hydrogen as there is a high affinity of titanium to hydrogen. When the amount of absorbed hydrogen exceeds 50–200 mass ppm, a pronounced degradation in the performance of nickel-titanium superelastic alloys occurs. However, contrary to our observations, Kaneko et al. demonstrated that hydrogen absorption was greater in beta-titanium wires as compared to nickel-titanium wires indicating that beta-titanium wires have more potential for surface corrosion when immersed in APF-containing mouthwash. However, they observed that nickel-titanium wire fractured before yielding while beta-titanium wire did not fracture which is similar to our observations. This difference may be due to the wire manufacturer difference. On immersion, in a solution of APF-gel, the cobalt-chromium-nickel wire showed surface roughness and morphological changes, and in APF-containing mouthwash, they exhibited scratches and localized pitting type of surface changes. While the stainless steel wires immersed in a solution of APF-gel and APF-containing mouthwash exhibited similar surface roughness, the corrosion products were distributed homogeneously. In the solution of APF-gel, stainless steel wires showed lesser surface corrosion as compared to cobalt-chromium-nickel wires. The similar surface observation was also seen by Kaneko et al. The chromium alloy wires, stainless steel wires, and cobalt-chromium-nickel wires showed almost similar type of surface corrosion in APF-containing mouthwash. The examination of immersed wires in SEM showed that at high magnification nickel-titanium wires and beta-titanium wires displayed more surface corrosion compared to cobalt-chromium-nickel wires and stainless steel wires. It has been stated that the SEM analyses should be mainly used to visualize the pathology and should not be used in isolation, without quantitative methods. Therefore, a step further was taken to quantify the surface changes caused by the solution of APF-gel and APF-containing mouthwash. All the tested four wires showed decrease in their tensile strength when immersed in a solution of APF-gel and APF-containing mouthwash. This indicates that immersion in fluoride is responsible for the degradation of mechanical properties of the archwires. Among all the wires, the lowest mean tensile strength was seen in nickel-titanium wire while highest mean tensile strength was seen in cobalt-chromium-nickel wire. Schiff et al. also observed similar results. The difference in mean tensile strength among the different immersions was also found to be statistically significant with control group recording the higher mean tensile strength followed by APF-containing mouthwash group and solution of APF-gel group, respectively. This suggests that the fluoride-related alloy effects depend on the fluoride concentration of the prophylactic agent. Lee et al. observed that increasing the sodium fluoride concentration in artificial saliva resulted in a decrease in corrosion resistance, of all test nickel-titanium archwires. In the solution of APF-gel group, higher mean tensile strength was recorded in stainless steel wire. This is in agreement with a study conducted by Kaneko et al. The highest mean tensile strength was recorded in cobalt-chromium-nickel wires when used with control and mouthwash immersion. However, this finding was contradictory to the observation done by Kaneko et al. This difference in the results might be because of variation in the composition between the wires provided by the manufacturers. The present study did not measure the amount of hydrogen embrittlement on the wire surface, which is a major factor in delayed fracture of wires. Furthermore, assessment of degradation by measuring the ion release in solution was not evaluated. Future studies can assess these parameters and in vivo studies can be carried out. Greater surface corrosion was observed in nickel-titanium and beta-titanium wires, and less surface corrosion was observed in stainless steel and cobalt-chromium-nickel wires. Schiff N, Grosgogeat B, Lissac M, Dalard F. Influence of fluoride content and pH on the corrosion resistance of titanium and its alloys. Biomaterials 2002;23:1995-2002. Cioffi M, Gilliland D, Ceccone G, Chiesa R, Cigada A. Electrochemical release testing of nickel-titanium orthodontic wires in artificial saliva using thin layer activation. Acta Biomater 2005;1:717-24. Walker MP, Ries D, Kula K, Ellis M, Fricke B. Mechanical properties and surface characterization of beta titanium and stainless steel orthodontic wire following topical fluoride treatment. Angle Orthod 2007;77:342-8. Lee TH, Huang TK, Lin SY, Chen LK, Chou MY, Huang HH, et al. Corrosion resistance of different nickel-titanium archwires in acidic fluoride-containing artificial saliva. Angle Orthod 2010;80:547-53. Kwon YH, Cho HS, Noh DJ, Kim HI, Kim KH. Evaluation of the effect of fluoride-containing acetic acid on NiTi wires. J Biomed Mater Res B Appl Biomater 2005;72:102-8. Wu SK, Wayman CM. Interstitial ordering of hydrogen and oxygen in TiNi alloys. Acta Metallogr 1988;36:1005-13. Kaneko K, Yokoyama K, Moriyama K, Asaoka K, Sakai J. Degradation in performance of orthodontic wires caused by hydrogen absorption during short-term immersion in 2.0% acidulated phosphate fluoride solution. Angle Orthod 2004;74:487-95. Johansson AK, Sorvari R, Birkhed D, Meurman JH. 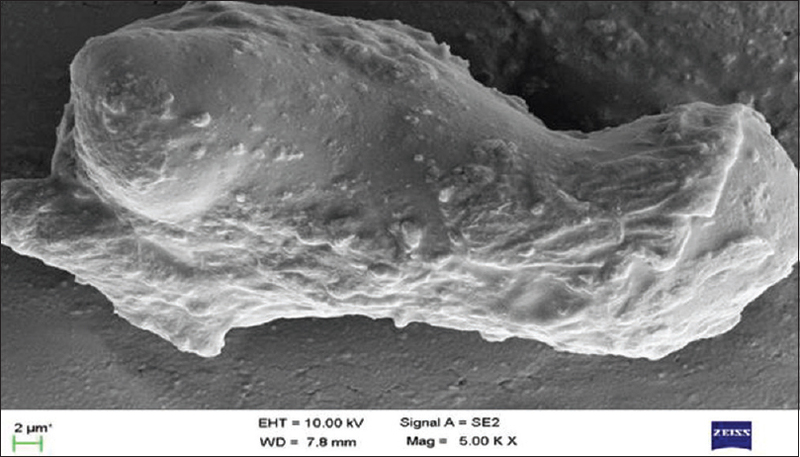 Dental erosion in deciduous teeth – An in vivo and in vitro study. J Dent 2001;29:333-40. Schiff N, Boinet M, Morgon L, Lissac M, Dalard F, Grosgogeat B, et al. Galvanic corrosion between orthodontic wires and brackets in fluoride mouthwashes. Eur J Orthod 2006;28:298-304. Lee SH, Chang YI. Effects of recycling on the mechanical properties and the surface topography of nickel-titanium alloy wires. Am J Orthod Dentofacial Orthop 2001;120:654-63. Kaneko K, Yokoyama K, Moriyama K, Asaoka K, Sakai J, Nagumo M, et al. Delayed fracture of beta titanium orthodontic wire in fluoride aqueous solutions. Biomaterials 2003;24:2113-20. Könönen MH, Lavonius ET, Kivilahti JK. SEM observations on stress corrosion cracking of commercially pure titanium in a topical fluoride solution. Dent Mater 1995;11:269-72. Toumelin-Chemla F, Rouelle F, Burdairon G. Corrosive properties of fluoride-containing odontologic gels against titanium. J Dent 1996;24:109-15. Huang HH. Effects of fluoride concentration and elastic tensile strain on the corrosion resistance of commercially pure titanium. Biomaterials 2002;23:59-63. Rondelli G. Corrosion resistance tests on NiTi shape memory alloy. Biomaterials 1996;17:2003-8. Kim H, Johnson JW. Corrosion of stainless steel, nickel-titanium, coated nickel-titanium, and titanium orthodontic wires. Angle Orthod 1999;69:39-44.